A lone Maori man, on the protest frontline at Standing Rock in North Dakota, has emerged on social media after performing a powerful haka against the Dakota Access Pipeline. The Maori raised the protesters' spirits at the weekend when he performed the Ngati Kahungunu tribal haka Tika Tonu to those on the frontline. He received a rapturous applause for his effort. Many Māori, the native people of New Zealand, have taken to social media to stand in solidarity with the Standing Rock Sioux tribe, which is protesting the construction of the Dakota Access Pipeline — a 1,172-mile oil pipeline the tribe believes will pollute its water supply and destroy culturally significant sites. “We need to show them the power and strength of indigenous international unity,” he says in the video. More than any other aspect of Maori culture, this complex dance is disciplined , yet emotional and an expression of the passion, vigour and identity of the race. It is at it's best, truly, a message of the soul expressed by words and posture.."
"Kia korero te katoa o te tinana." (The whole body should speak). Responses to "Haka on the frontline! 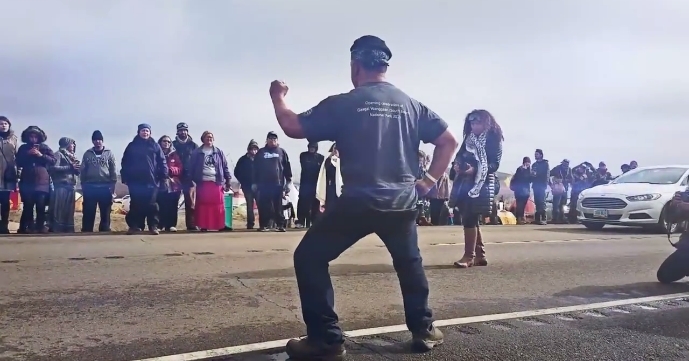 Maori man's stirring haka against Dakota Access Pipeline"
We all need to save Mother Earth, and the falls of water what affects the whole globe. We need this water for our lives, we need it for to not unbalance the world and cause more global warming. We are all behind you, fighting with you, and for your natural rights. Greetings from Finland <3 We are concerned of the future for our children, grandchildren and their children, we are concerned about the future, will there be sun shining over the glancing pure water, or will there be a mantle of shadows, eating the earth till it will rotten? Here is one who want to open up the pipelines, who doesn't believe in Global warming, he says it is a HOAX set by Chineses. Airplane crashes are horrific and many people lose their lives when they occurr. Air travel remains one of the safest ways of transport. Yet, we don't ban air travel because a plane crashes. Pipelines too are about risk management. Rail and transport are not the safer options. There are eight pipelines under the Missouri river. If we shut those down the oil and gas will still cross the Missouri River. How many land base spills and accidents and deaths are an aacceptable trade-off? good on you Sefo.........stand for us........we haka with you each time! Wanji Oyate !! Wanji Wowicake !! !Kihci Manito !! What is tribal thinking about the ROLE (if any) should risk management and science play in the Balken Oil transport decision making process? Note the 2013 rail disaster in Quebec, Canada, where a train carrying crude oil derailed and destroyed downtown Lac-Megnatic.